A quiche needs a crust! 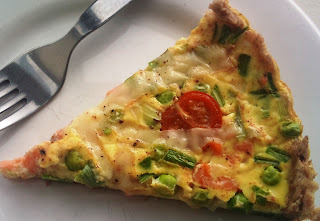 Many recipes for low fat quiche advocate making one without a crust resulting in a soggy eggy mix with no base. 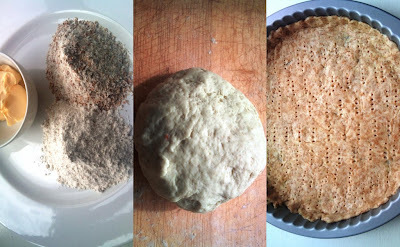 This recipe does have a crust, albeit a thin one. To keep the calories down, the base is made with a mix of plain and whole meal flour that's bound together with low fat butter and cold water. The secret to making good pastry is work quickly and don't over handle the mix! The recipe will make 8 portions. Sift the flour into a large bowl. (Return the husks from the wholemeal flour to the bowl). Add the salt and make a well in the centre. Add the iced water one tablespoon at a time and clump the dough together into one piece. Transfer the dough to a bowl or plate and allow to chill for 30 minutes or so. To bake the base, turn the oven to 190°C degrees. Turn the dough out onto a lightly floured board or clean work surface and roll out using a rolling pin or bottle so it's the approximate diameter of an 8.5 inch flan tin. Spray the flan tin with spray oil. Lift the rolled out pastry using a knife or rolling pin onto the tin. Flatten the dough out using your hand and make sure it covers the base and goes half way up the sides. Prick the base with a fork. (This allows any air trapped underneath to escape). Add a layer of tin foil or greaseproof paper and add baking beads or dried pulses to weigh the foil down. (This is called blind baking). Bake the case blind for 10 minutes. Carefully remove from the oven and lift the foil and beans off. Return the base to the oven for a further 5 minutes until it's golden brown. 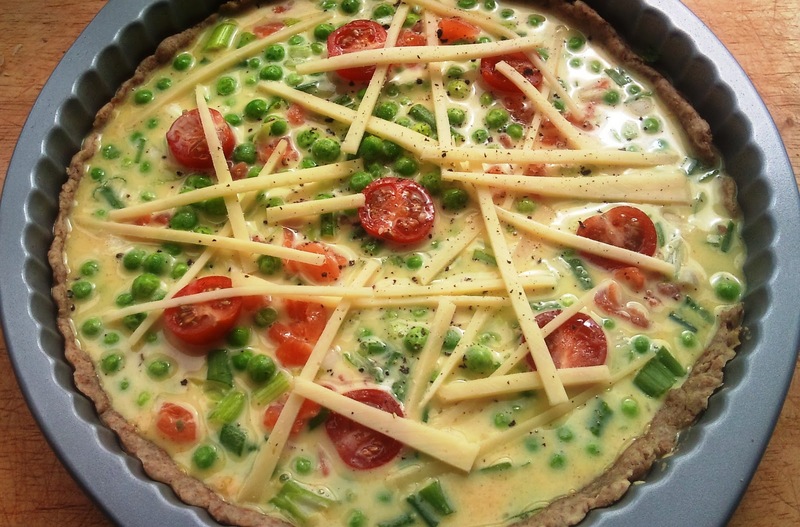 Once it's cooked removed from the oven and allow to cool slightly, while you make the filling. 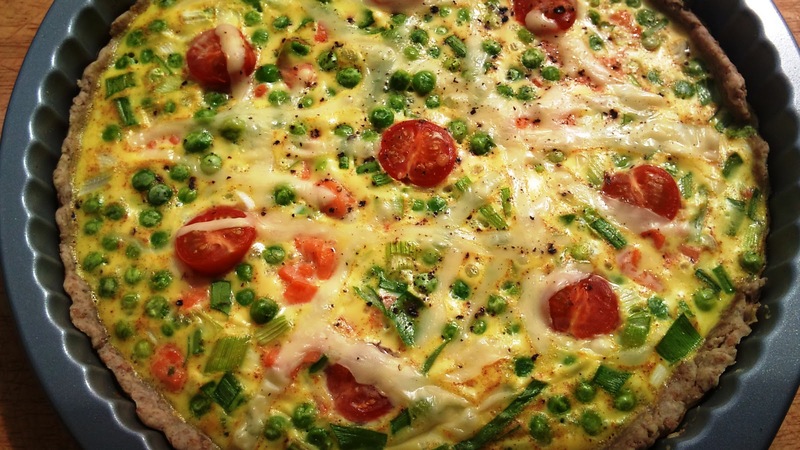 To complete the quiche, mix the eggs, milk and crème fraiche together in a jug. 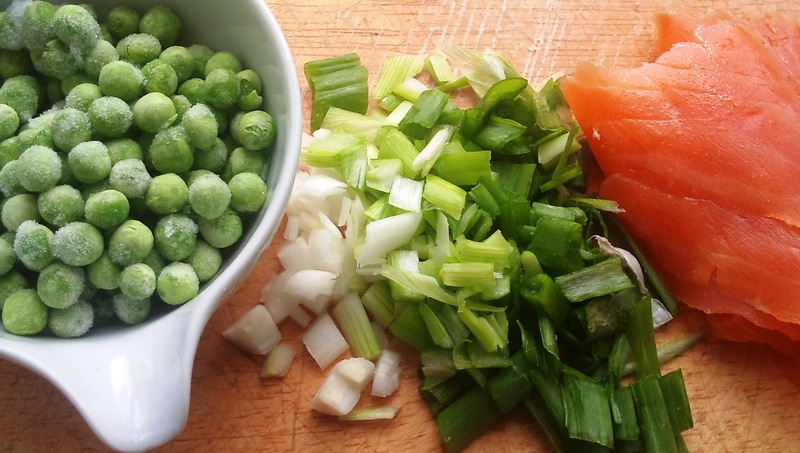 Place the smoked salmon, peas and spring onion into the cooked base. Sprinkle the curry powder over the fish and peas. 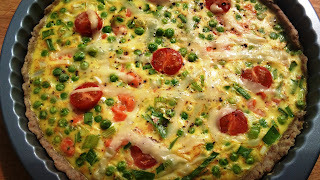 Next, pour the egg mixture into the base and add the tomatoes, cheese and pepper. Bake in the oven for 30-35 minutes. Carefully remove and allow to cool. Remove from the tin, slice and serve.